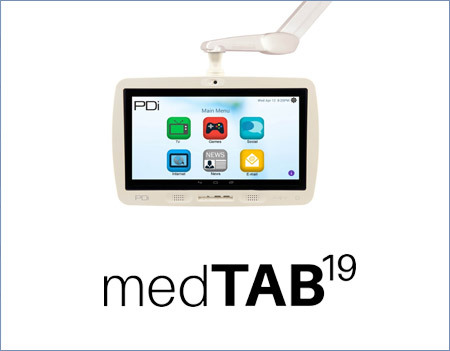 medTAB is the best way to deliver the medTV experience.The 19” medTAB brings the standard TV and the freedom of the world wide web together in one device. Give patients the comforts of home with the ability to surf the web, play games, connect to friends and family and more - with an interface that’s easy to navigate and fun to engage with. Meet your facility’s initatives and maximize CMS rembursements by satisfying and empowering patients with a scalable solution designed to improve patient experience.